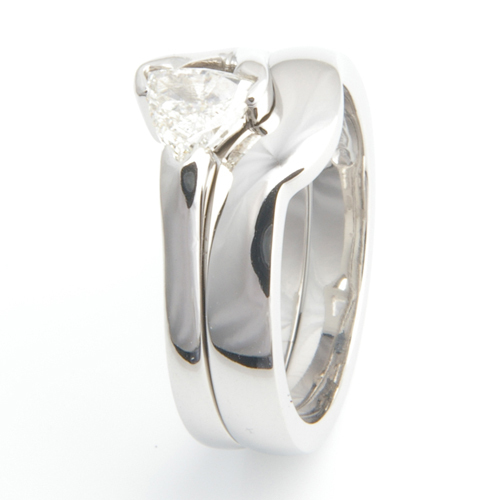 Platinum Plain Fitted Wedding Ring to Trillion Diamond Engagement Ring — Form Bespoke Jewellers Ltd.
With a trillion cut diamond engagement ring, a fitted wedding ring is often the best choice. The team at Form Bespoke Jewellers in Leeds created this bespoke fitted wedding ring to fit perfectly alongside the customer’s platinum engagement ring (which was also made by us here in our Yorkshire workshop). The customer chose to stay with a classic wedding band style, choosing a plain platinum wedding ring to allow for the attention to stay with their beautiful trillion cut diamond engagement ring.